Survival-quest ZARYA is a survival text based quest with elements of science fiction, horror, and occasional humor. In this game you will be able to alter the story by making choices, creating your very own adventure. If you liked Alien, Dead Space and Lifeline – you’ll love this. THE STORY. In 2021 humankind received a distress signal from the far side of the Moon, and immediately sent four brave people to investigate its source. You will be monitoring the astronauts and make decisions that will directly impact the story and the characters. Each choice may lead you closer to – or farther from – the truth. Can you unearth the truth and solve the mystery that our Moon is hiding? Download Zarya – 1 now! 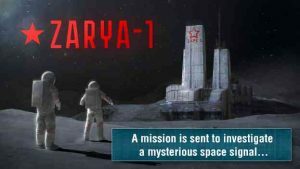 Zarya is a fantastic choice-based survival game with a clever storytelling system centered around a text-based interface. With a compelling soundtrack, likeable characters, and a spooky plot, it will definitely be worth your time. You can speed up wait periods by watching ads, but I bought the pass so I could just play. It’s worth it! Great concept, bringing story to life. Love the sequences that bring one into the story. Choices. One of the best games for the phone, i was truly invested in the mysteries and was actually scared at some points. Would love a sequel indeed. Great job people. Great storyline! Hoping to have a sequel to this. A true survival quest. This game gives a true adventure feeling. The graphics are too good. It’s WORTH DOWNLOADING. Just give more options to text. SPOILER ALERT!!! Great game with an outstanding story. Almost everything about this game is perfect. However, after the crew get home with the hard drive, I would have liked to know what was on it, since they killed Sarge and endangered Bones’ family for it. Maybe just add a second email from the head of UNSEED explaining how the story ends. Apart from that, great game! I’m desperately awaiting the sequel. Keep up the great work dev’s!! This is definetly the best decision story game I have ever played!!! I love how there is a censor that blocks swear words, well except for a few, but its still nice. There is nothing innapropriate which is wonderful!! I love how the story just draws you in and makes you want to just keep reading even though it can be extremely extremely scary, lol. I love the sci-do aspect to it. Its exactly like watching a movie but your in it and changing the story with every decision! I Definetly suggest playing this with friends and having them help you pick what to say as it is a fun story to do with friends. The quality is amazing!! The characters have very interesting personality which always helps make a story better. I Definetly suggest getting this game!